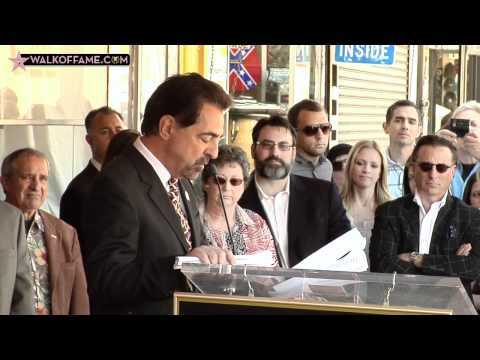 Veteran actor Joe Mantegna was honored with star on the Hollywood Walk of Fame. Emcee Leron Gubler, Hollywood Chamber of Commerce, President/CEO and guest speakers David Mamet and Lt. General Willie Williams will help unveil the 2,438th Star in the category of Live Theater at 6654 Hollywood Boulevard on Friday, April 29, 2011 at 11:30 a.m. Celebrities attending included Andy Garcia, Clifton Collins, Jr., Shemar Moore, Kirsten Vangness, A.J. Cook, Jean Smart, Dennis Franz, Lee Purcell, Stan Shaw, Meshach Taylor and many others. Chicago native Joe Mantegna has a strong background in both theater and film. After making his Broadway debut in Stephen Schwartz's musical of Studs Terkel's Working, Mantegna was awarded the Tony and Joseph Jefferson Award for his acclaimed performance as cynical real-estate agent Richard Roma in David Mamet's Pulitzer Prize-winning play Glengarry Glen Ross. Closely associated with Mamet’s work, Mantegna starred in the theatrical premiere of A Life in the Theater, The Disappearance of the Jews at the Goodman Theater, and in the Broadway production of Speed the Plow. In addition, Mantegna directed a critically-acclaimed stage production of Mamet's Lakeboat, starring Ed O’Neil and George Wendt. Mantegna made his feature film debut in 1985 in Frank Perry's Compromising Positions, based on Susan Isaacs’ best seller. His early films include co-starring roles in The Money Pit, Weeds and Suspect. He also starred in the critically-acclaimed David Mamet films House of Games and Things Change, for which he and co-star Don Ameche both received the coveted Best Actor Award at the Venice Film Festival. In 1991, Mantegna starred in the highly-praised police thriller, Homicide. His other films include Alice, Celebrity, The Godfather III, Liberty Heights, Bugsy, Searching for Bobby Fischer and Forget Paris. Other stand-out roles include Up Close and Personal, Baby's Day Out, Airheads, Queens Logic, Wait Until Spring, Bandini, Eye for an Eye, The Runner and Thinner. Mantegna had a starring role in the CBS miniseries of Mario Puzo's best-selling novel The Last Don, which garnered him an Emmy Award nomination. He also enjoys appearing regularly as the voice of Fat Tony on The Simpsons. Mantegna's original feature films for cable include starring roles in State of Emergency, A Call to Remember, My Little Assassin, The Water Engine, The Comrades of Summer, Persons Unknown, Boy Meets Girl, and The Rat Pack, for which he was nominated for both another Emmy and a Golden Globe Award. In later films like Hoods and Jerry and Tom, Mantegna both starred and served as Executive Producer. In 2000, Mantegna completed production on his feature film directorial debut, Lakeboat, written for the screen by David Mamet from his original play. Starring Charles Durning, Peter Falk, Robert Forster, Andy Garcia, Denis Leary and George Wendt, the film opened the L.A. Film Festival to critical acclaim last fall and made its theatrical release in June 2001. Mantegna starred for two seasons as police chief Will Girardi in Joan ofArcadia. The show received several Emmy and Golden Globe nominations during its run. In the Fall of 2005 Mantegna co-starred in Nine Lives, a film by Rodrigo Garcia. The film was accepted in Sundance in 2005 and also starred Glenn Close, Amy Brenneman, Holly Hunter, Dakota Fanning, Sissy Spacek and Kathy Baker. In 2006, Mantegna was as busy as ever with roles in Elvis and Anabelle, West of Brooklyn and the USA Network Mini Series Starter Wife with Debra Messing. Since 2007, Mantegna has starred in original episodes of the hit drama Criminal Minds on CBS and now can be seen in syndication on ION Television, where he plays FBI special agent David Rossi. His contribution to the hit series has catapulted the show into one of ION’s highest-rated series and, in turn, helped ION recently record its most watched quarter ever. In 2010 Mantegna lent his voice to the upcoming Disney/PIXAR film, CARS2 and has several projects in the works including a web-series. For the past nine years Mantegna has participated in the National Memorial Day Concert in Washington DC, and has co-hosted the last four with Gary Sinise. Mantegna has always been a supporter of our men and women who serve and in 2005 he was appointed the Honorary Chairman for The Salute to Hospitalized Veterans. In 2007 he was instrumental in raising thousands of dollars for Operation Iraqi Children., a charity formed by Gary Sinise to give school supplies to children in Iraq and Afghanistan delivered by US Military troops.When possible he visits wounded service men and women at the VA Hospital. Mantegna has helped raise millions of dollars for charities all over the world, including Autism, The Barbara Sinatra Children’s Center, Pediatric Aids Research, The National Kidney Foundation, Easter Seals, Melanoma Research, The Tom Sullivan Blind Children’s Charity and Breast Cancer Awareness.